You are here: Home / Cebu Pacific / CEBU PACIFIC AIR: FLIGHTS FOR AS LOW AS 499 BASE FARE ONLY! CEBU PACIFIC AIR: FLIGHTS FOR AS LOW AS 499 BASE FARE ONLY! Any plans for your next month’s summer escapade? Spend your summer and make happy moments to any of our Philippine picturesque destinations. Book your summer travel flights for as low as 499 base fare only with Cebu Pacific Air. 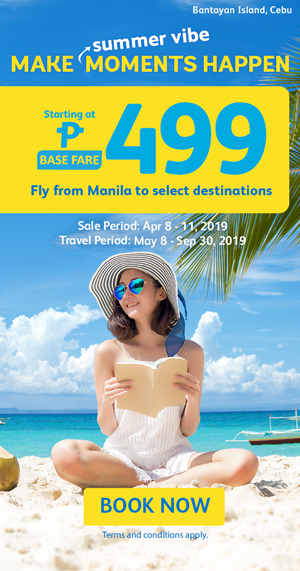 Sale period is until April 11, 2019 and Travel from May 8 to September 30, 2019.